How does one begin to convey the influence Gwendolyn Brooks has had on generations-not only writers, but people from all walks of life? How can one describe the fiercely personal connection her poems make, how chronicle her enormous impact on recent literary, social, and political history? There is a tradition in the black church: we call it Testifying. It is the brave and humbling act of standing up among one's family, friends, and neighbors to bare one's soul, and to bear witness by acknowledging those who have sustained and nurtured the testifier along the way. Standing in front of this literary congregation as a grown woman, a woman who has entered her 40s, I feel very strange thinking that when Gwendolyn Brooks was awarded the 1950 Pulitzer Prize for "Annie Allen," her second collection of poems, I was not even, as people used to say then, "a twinkle in my daddy's eye." I was born two years after Gwendolyn Brooks, as the first Black writer ever, had received this highest honor in American letters. And it wasn't until 17 years later, when as a gawky adolescent I spent the whole of a muggy midwestern summer combing the local library shelves for something that might speak to me-that the poems of Gwendolyn Brooks leapt off the pages of the book in my hands and struck me like a thunderbolt. These were words that spoke straight from the turbulent center of life-words that nourished like meat, not frosting. Yes, I was struck by these poems, poems with muscle and sinew, poems that weren't afraid to take the language and revamp it, twist it and energize it so that it shimmied and dashed and lingered. From that summer on I read everything by Gwendolyn Brooks that I could get my hands on: First I went back to her early books, "A street in Bronzeville" (1945) and the Pulitzer volume "Annie Allen;" then there was "Selected Poems," which came out in 1963, followed by "In the Mecca: poems in 1968" and "Riot," published in 1969, the same year she was selected to succeed Carl Sandburg as Poet Laureate of the State of Illinois, a position she still holds. And most recently I admired her "The NearJohannesburg Boy and Other Poems" (1986) and "Blacks," collected poems, published by the Third World Press in 1987. Gwendolyn Brooks also ventured successfully into prose. "Maud Martha," her moving novel, came out in 1953. The autobiographical remembrances and reflections "Report from Part One" and "The World of Gwendolyn Brooks" were both published in 1972, and in 1980 "Primer for Blacks" appeared. But Gwendolyn Brooks not only spoke loud and clearly through her books; she made herself heard on numerous disc recordings, in trenchant interviews and through books about her life and creative work. Honors for her outstanding achievements include, besides the Pulitzer Prize and poet laureate position, grants and awards from the likes of the Guggenheim Foundation and the National Institute of Arts and Letters. 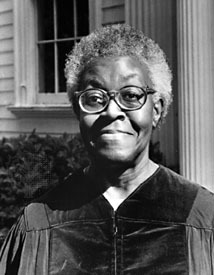 As someone who, as a Black child, was educated in a literary tradition that seemed to have little use for my existence except as a caricature or in servitude and who, as a young person, came of age in a society where the discourse of the melting pot effectively translated into: "Disappear into the mainstream or Else," I know that Gwendolyn Brooks was among the few who gave me the courage to insist on my own story. And though I never dreamed of following in her footsteps as far as the Pulitzer Prize, her shining example opened up new possibilities for me and generations of younger artists. Thank you, Gwendolyn, for your invaluable contributions to changing the face of our world. Gwendolyn Brooks' first published collection, A Street in Bronzeville (1945), reveals her talent for making the ordinary life of her neighbours extraordinary.Annie Allen (1949), for which she won the Pulitzer Prize, is a loosely connected series of poems related to a black girl's growing up in Chicago. The same theme was used for Brooks's novel Maud Martha (1953). The Bean Eaters (1960) contains some of her best verse. Her Selected Poems (1963) was followed in 1967 by The Wall and in 1968 by In the Mecca, half of which is a long narrative poem about people in the Mecca, a vast, fortresslike apartment building erected on the South Side of Chicago in 1891, which had long since deteriorated into a slum. The second half of the book contains individual poems, among which the most noteworthy are Boy Breaking Glass and Malcolm X. Brooks also wrote children's poetry: Bronzeville Boys and Girls (1956). We Real Cool (1966) remains her most popular. The autobiographical Report from Part One (1972) was an assemblage of personal memoirs, interviews, and letters. Later works include Primer for Blacks (1980), Young Poets' Primer (1981), Mayor Harold Washington and Chicago, the I Will City (1983), and Blacks (1987), a collection of her published works. Gwendolyn Brook's works also include Family Pictures, Riot, An Autobiography, and To Disembark. Brown, Patricia L., Don L. Lee, and Francis Ward, eds. To Gwen, with Love. Chicago, Johnson, 1971. Colorado Review n. s. 19, no. 1 (Spring and Summer 1989). Davis, Arthur P. From the Dark Tower: Afro-American Writers 1900-1960. Washington, D.C.: Howard University Press, 1974. Kufrin, Joan. "Gwendolyn Brooks." Uncommon Women, 35-51. Piscataway, N.J.:New Century Publishers, 1981. Loff, Jon N. Gwendolyn Brooks: A Bibliography. College Language Association Journal 17 (September 1973): 21-32. Madhubuti, Haki R., ed. Say That the River Turns: The Impact of Gwendolyn Brooks. Chicago: Third World Press, 1987. Melhem, D. H. Gwendolyn Brooks: Poetry and the Heroic Voice. Lexington: UP of Kentucky, 1987.
and Interviews, 11-38. Lexington: UP of Kentucky, 1990. Miller, R. Baxter. Langston Hughes and Gwendolyn Brooks: A Reference Guide. Boston: G. K.Hall, 1978. Mootry, Maria K., and Gary Smith. A Life Distilled: Gwendolyn Brooks, Her Poetry and Fiction. Urbana: UP of Illinois, 1987. Shaw, Harry B. Gwendolyn Grooks. Boston: Twayne, 1980. Wright, Stephen Caldwell. The Chicago Collective: Poems for and Inspired by Gwendolyn Brooks. Sanford, Florida: Christopher-Burghardt, 1990. Wright, Stephen Caldwell. On Gwendolyn Brooks: Reliant Contemplation. Ann Arbor, Michigan: University of Michigan Press, 1996. We have no connection with, nor do we know how to contact the estate of Ms. Brooks. This page was written and maintained for The Circle Association. To contact us go to contact. Please mention the name of this page in your notes, but do not request analysis of poetry. This page is inspired by and dedicated to my three daughters, Rachael, Rebekah, and Eve.